Hi all just bought a lovely 1991 Cruising Cabin Diesel 2.8 with selectable 4WD. I understand that I need to turn something on the front hubs to engage 4WD - but there is also a button on the dashboard and a second gearstick in front of the main automatic gear selector. What do I do with all these? Help! ....and the links in the later posts. Good info there! Your location says you are in London... are you not caught out by the LEZ? I got badly stung by them when I passed through a few years ago! - When offroading, choose to use it or not. I tend to use it only when I notice the van is struggling. When offroad, the going gets though and there are some steep inclines, you will want to enable 4wd of course. You have to be in 4wd mode to be able to use the low-gearing for the steep inclines or declines. If you use 4wd on dry tarmac, you will put extra wear on the system, as there is lots of tension. This way you can break the transfer case. You will also notice this in heavy steering. Thanks for the quick replies. . I get the bit about when to use 4 WD and I know about turning the hubs. Interesting that this doesn't engage 4WD until I press the 4WD button. I'll have to follow the links carefully to see what the second gearstick does - after all, on the main shifter there is already the possibility of selecting low range. This vehicle either meets the required emission standards, is exempt from the scheme or is subject to a 100% discount. THere is a new Ultra Low Emission Zone coming in next year - and this woudl mean paying about £12 extra a day when in the zone. Fortunately I live a little outside the South Circular and don't intend driving into the centre of town. I'm lucky enough to have an over 60's Oyster card - free public transport in London. The L on the main shifter just prevents the auto box changing up from 1st. If descending a long hill, for example, you can use it (or 2 for 1st & 2nd) to stay in low gear for better engine braking to save overheating the brakes. Alternatively, you can use it to control your speed when it's slippy (Snow? Ice? Mud?) without using the brakes. This avoids the wheels locking, enabling you to maintain control. Once you have 4wd engaged, however, you can move the smaller lever and have a reduction gear ("low range"); which gives more torque at the wheels (e.g. to pull a heavy trailer up a steep slope) and allows you to crawl slowly over uneven or slippy ground. You can only move the hi/lo lever when the 4x4 button is illuminated and the autobox in N. I presume that means don't touch it while driving along. I understand from the owner's manual that using the main lever you can shift down while you are moving (within certain speed parameters). 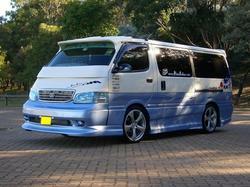 Hi Andonic, welcome to Hiace ownership. I've had my wagon for almost 6 years and love it. I can't get in the low emission zone though. What engine is your one? I;m running the 2.8 diesel with selectable 4wd. Also meant to say thanks for finding out how to use the hi lo lever. I've never got round to asking how to use that part. Haven't needed it. My first use of the 4wd was driving off a festival site in Wales where every other vehicle was towed out. Loved it! The LEZ tax goes on the year the vehicle was registered,not year of manufacture.Its a bit of a glitch in the matrix.My 1994 super gl pays nothing because it was registered in the uk after 2006. Lovely aint it ?Going to take a while for them to close this loophole. Please leave it idling in the P range until it goes out. H4_L4 Lever operation L4 (Low range four-wheel drive): Please use it especially when you need a large driving force. 1 Shift operation to H4, L4 equipped with a LE Wheel Hub should be done after both left and right freewheel HUFs are set to the "LOCK" position. 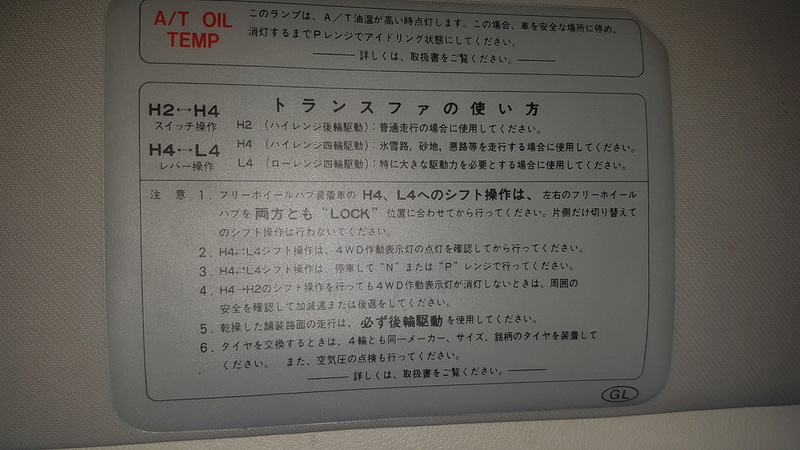 2 H4, "L4 Shift operation must be confirmed after turning on the 4WD operation indicator"
3.H4.L4 Shift operation should be stopped in the "N" or "P" range. Yes, if it sticks in 4wd even though you turned it off, reversing is usually the easiest way to get it to let go. And indeed always use the same tire size on all wheels.